The Work of a Renaissance Master. Tommaso Cassai, also known as Masaccio, was another great Florentine artist who emerged at the beginning of the fifteenth century. He was born in 1401 and lived with his younger brother and his widowed mother. The family lived in great poverty but the financial situation seems to have eased on the remarriage of his mother. Florence was under the control of Cosmo the Elder and the Medici had become the first family of the city both artistically and politically, and the city itself was enjoying a period of calm and prosperity. 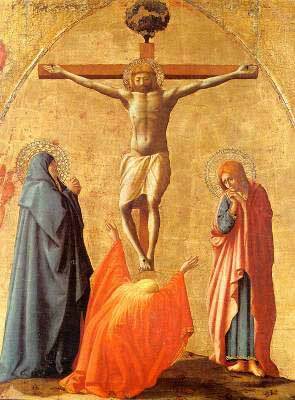 Masaccio was accepted into the guild of painters in Florence in 1422 he became friends with Donatello and Brunelleschi and was influenced by their work. Giotto was also a major source of inspiration for the painter, and he embraced Giotto's example in a rejection of the International Gothic style of the time. He is one of the first artists to use a vanishing point in his work employing the use of scientific perspective in his paintings. 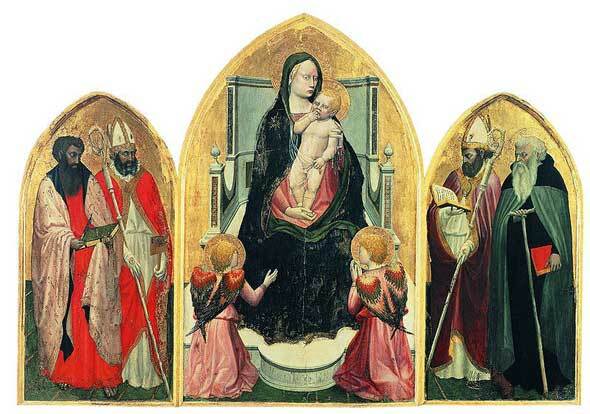 The first work attributed to him is the San Giovenale Triptych in the church of Cascia di Reggello near Florence. The expulsion of Adam and Eve. His two major works are a polyptych, painted for the Carmelite church in Pisa, and his frescoes in the Brancacci Chapel in Florence painted in or around 1425/6. 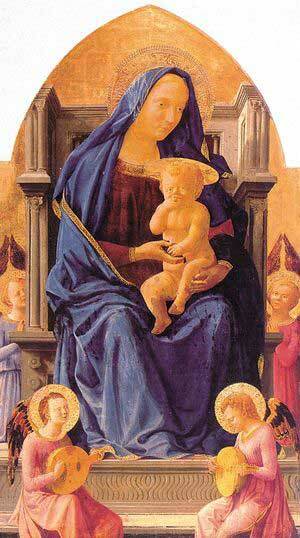 "Madonna with Child and Angels"
In 1427 Masaccio painted his Holly Trinity for the Santa Maria Novella church in Florence. This fresco is considered to be one of his finest masterpieces and was rediscovered in 1861 after being hidden by a stone altarpiece in the sixteenth century. Masaccio's early demise has meant that very few works exist that are entirely attributed to him. Collaborations with other artists include the Madonna and Child with St Anne, painted in collaboration with Masolino, and Madonna and Child and Angels, painted with his brother Giovanni. In about 1428 the artist left Florence and travelled to Rome where he died at the age of 27. During his short life, he did not enjoy the popular esteem given to some of his contemporaries, his fame was confined to other painters, but his influence on successive generations of artists is profound. It is said that all the Florentine artists studied his work, including Michelangelo. His legacy was to direct Italian Painting way from the Gothic style and towards a more realistic and natural interpretation of the world.